Natch and Feral hanging on my every word. Bank fishing is a very enjoyable way to fish for trout because it combines sitting in a chair with the illusion of doing something productive. Maybe you can relate to that. Here are some tips to make the experience memorable and with a lot of luck, catch a trout. You’ll need at least two buddies who are more serious about bank fishing than you because someone needs to catch a fish, otherwise what’s the point? Study the faces above and try to find guys that look different. Maybe that nerd from work. Or that guy that drinks Pepsi all day? The important details: If possible, cut your forked stick before you head down to the stream because that will allow you to set up in the best spot while your buddies are cutting their sticks. 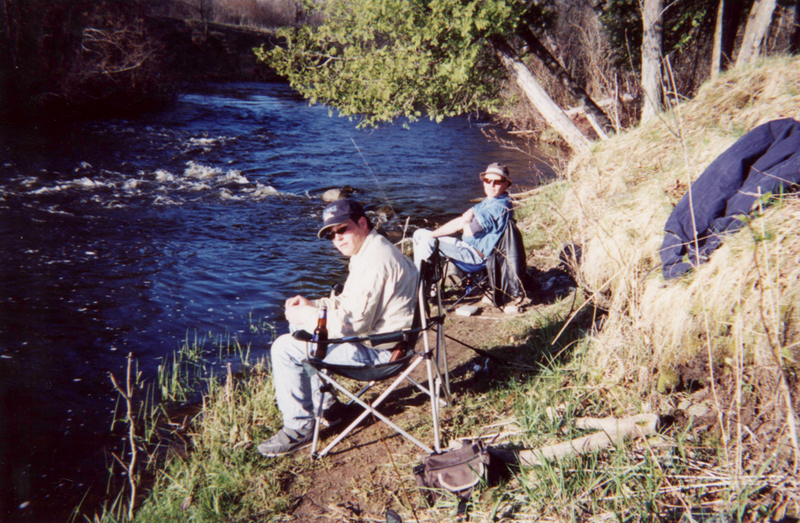 The best spot will be the one that is upstream of the big pool so when you cast your line it drifts to the middle of the pool so your buddies have to get their lines out of the way. If your line does cross theirs, shake your head and make a face to let them know you’re not used to fishing with amateurs. If you get a bite (rare) or hook a trout (more rare) deliberately move downstream so they have to get out of the way. Add some excitement by flailing the rod so they understand they could get an eye poked out. Then let the the trout zig zag the whole pool so your buddies are relegated to strictly watching. This is your moment – put on a show! Caution: This can backfire. If the trout is under ten inches try to release it discretely before they get a look. Between bites most anglers like to lie about the huge trout they caught in the very same pool. Believability goes up in direct proportion to the amount of beer in the cooler so if you are prone to reminiscing make sure someone, preferably one of your buddies, bought the right brand of beer and ideally carried the cooler down to the stream by himself. Make sure you do a few jerky spasms and mention your bad back well ahead of time, ideally back at camp when it’s time to gather firewood. If it still falls on you to bring the beer – make sure it’s not twist tops and that you have the only opener. Someone needs to regulate consumption. It’s for their own good. A comfortable chair is a must. If you have a leather recliner that will fit in the back of your pickup and will roll down the hill to the stream – that is ideal. (If you have a winch you can use to get it back up the hill – even better). Barring that, try to avoid those confounded collapsable camp chairs that sit crooked on level ground. You know the type. You have to be a yoga expert to get out of them. Tackle: Don’t use your good stuff. The chance of getting hung up on a log on the bottom of the stream is 100%. Breaking the tip off your pricey Fenwick rod is a loss no angler can afford. Now’s the time to haul out the garage sale surf rod with wrought iron core. Something with backbone. Grab a reel with light line – chances are you’ll only catch tiny trout anyway and light line has some advantages that go right to strategy. Stream Strategy: When you get hung up on a log pretend it is a lunker and break your line quickly. It’s the big one that got away and your status as a bank fisherman jumps ten points.